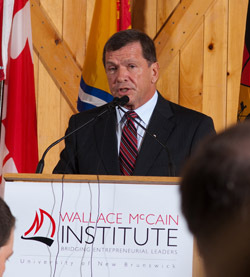 Miramichi entrepreneurs are being given the opportunity to grow their businesses, thanks to a significant gift made by Frank McKenna today. Mr. McKenna, Deputy Chair of TD Bank Group and former premier of New Brunswick, announced a funding contribution of $1 Million for the Miramichi region in a speech to the Miramichi Chamber of Commerce and the Wallace McCain Institute for Business Leadership at the University of New Brunswick today. The gift is being made to fund the growth of technology companies in the region. Mr. McKenna says he’s thought long and hard about what I could do that would bring the most benefit to the region and concluded that helping to create a new economic base in the Miramichi, based on knowledge and technology, would truly be a ‘gift that keeps on giving’. The goal is to financially assist, each year, two to five Miramichi companies with an exportable technology product or service and a sustainable business plan. The participants will also gain knowledge and experience through the Wallace McCain Institute’s Entrepreneurial Leaders Program (ELP). Eddy Campbell, UNB president, says our greatest resource in New Brunswick is our people, and investments in our people are what will help make us a smarter province. Applications for funding will be accepted by Enterprise Miramichi this summer and the first round of funding will be invested in companies near the end of this year. Nancy Mathis, Wallace McCain Institute for Business Leadership, at nancy.mathis@mccain-institute.com, or (506) 721-3820.